It is of utmost importance to clean any new gemstones that come your way to clear them of any energies that they may have picked up during their previous journeys. Also, if you use any of your stones as healing tools, they should be cleaned before and after each healing session. Healers will dedicate or program crystals to increase or enhance their vibrational energies. The programming also helps protect the stones themselves from absorbing any harmful energies while they are in service. There are many different ways to clean your gemstones. Choosing the best cleaning method depends on the type of stone you want to clean. An hour in direct sunlight is more than enough to clean most stones. However, certain stones will fade if left out in the sunlight. Amethyst is one example. Keep your amethysts out of direct sunlight if you want them to retain their vibrant purple hues. Other stones that will fade include aquamarine, citrine, fluorite, rose quartz, and smoky quartz. Moonlight cleansing can take several hours or days. To expose a stone to all the moon phases (from a full moon to a new moon), place the stone outside each evening at dusk (retrieving it before sunrise) for 28 consecutive days. Most stones will be OK in freshwater (or even tap water), but some stones will dissolve in water (such as azurite, angelite, phenakite, selenite, and the like). Some will dissolve or scratch in saltwater, including: amber, turquoise, hematite, imperial topaz, red coral, opals, pyrite, lapis lazuli, moonstone, and calcites. Don't clean rough or raw stones in saltwater or those with a hardness level less than seven. Make sure any cloth that you use is soft and won't shed fibers. 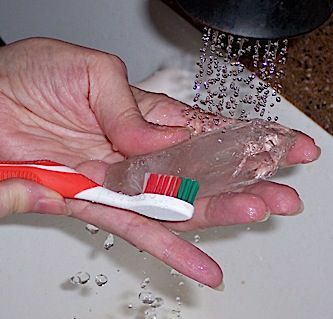 A soft-bristled toothbrush is an option as well, especially for water methods. Sunlight: Energize crystals in the sunlight. Moonlight: Energize crystals under the moonlight. Saltwater: Soak crystals inside a bowl filled with saltwater. If you go to a sea or an ocean to cleanse them, secure them in a mesh bag, or you might lose them. Brooks, lakes, rivers: Cleanse crystals in a natural water reservoir (lake, river, creek, pond, or even under waterfall). Brown rice: Purify crystals overnight submerged in a bowl of uncooked brown rice. Then move them to the sunlight in the morning for an hour. Compost the rice afterward. Earth: Bury crystals in the earth for a ritual purification. Don't use this method for crystals containing iron, such as hematite, pyrite, and tiger iron. Cold tap water: Scrub crystals under a running tap of cold water. Reiki: Infuse crystals with balancing reiki energies and symbols. White light: Visualize a beam of white light to cleanse your crystals. Purple plates: Cleanse and re-energize with the positive energy of purple plates. Selenite: Use a selenite wand to wave over your other stones (selenite has cleansing properties). Intentional breath: Blow onto the stone with clearing intention. Rainfall and thunderstorms: Set your stones outdoors during a rainfall for a natural washing. Energize them further by allowing them to sit out during a thunderstorm. Dewdrops: Collect dew drops from grass or leaves to cleanse your stones.